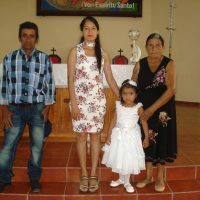 "The contents of this website are mine personally and do not reflect any position of the US Government or the Peace Corps"
My friend Celeste asked me to help transport a little girl and her family to church and then to a brief celebration after the baptism. Celeste was the god-mother. 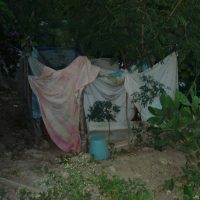 The family is very poor living in a small dirt-floor adobe hut high on a hillside at the end of a steep rocky pathway. The outdoor latrine is behind the hanging cloth door. 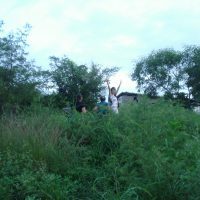 The family lives in a barrio where Celeste does missionary work and I occasionally help. Then a week ago, I traveled to La Ceiba to see my goddaughter Yelsi and to take my Honda Hybrid in for its 6-month maintenance checkup. Sorry about the fuzzy pic where I treated Yelsi and her cousin to lunch. 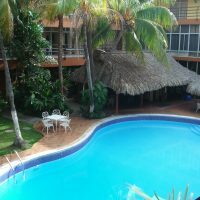 As usual, I stayed at my favorite hotel in downtown La Ceiba for my five-day mini vacation. 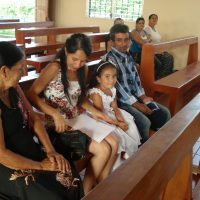 Honduras is a nation of stark social contrast. This entry was posted in Everyday on 14. July 2018 by Fortunato Velasquez.